Happy Thursday, friends! 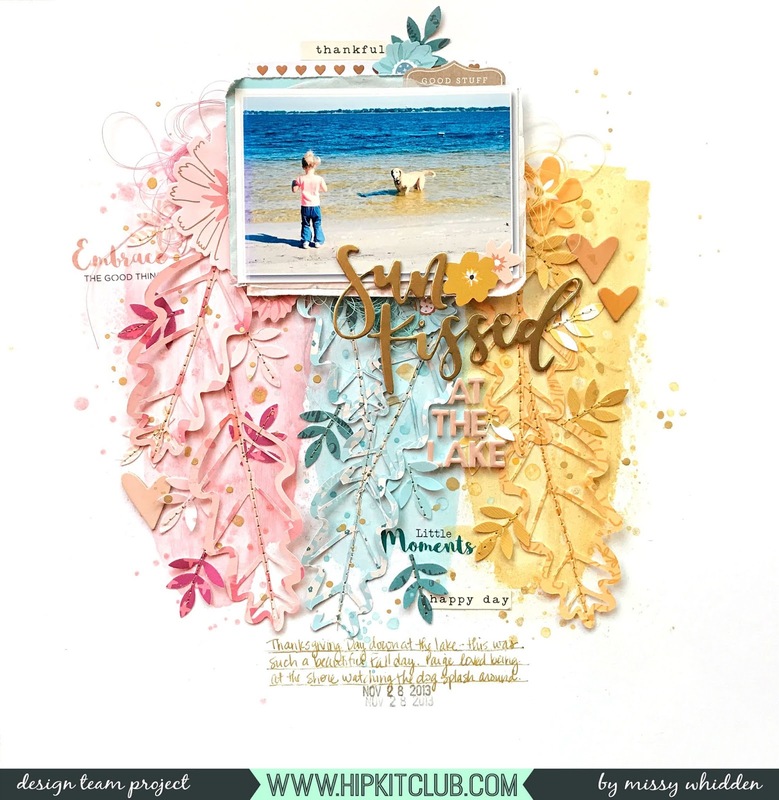 I have a nontraditional Fall layout to share today for the Hip Kit Club. I used the 2018 October Hip Kits. I don’t have typical Fall photos since I live in Florida, so our Fall kind of resembles Summer…haha. This photo was taken on Thanksgiving, so technically it is a Fall photo. I used a leaf cut file from one of this month’s subscriber files, and I cut it on three patterned papers from the Main Kit. I went with a tone-on-tone look by using all three Shimmerz from the Color Kit on the background. I used clear gesso first on the white cardstock. I sprayed a bit of the Vibez Pop Art Pink and then used a palette knife to scrape the color down into a big stroke shape. I also used the Creameez Ride the Tide and Shimmerz Sunflower. I positioned the leaves on the matching colors. I also used a leaf punch from my stash and created a few more leaves using some Project Life cards and more patterned papers. I machine stitched through the centers of each leaf for some added texture and shine. I used one of the Thickers from the Main Kit as my title and completed it with some of the Whimsical Mini Thickers. I love the soft pink color. I embellished with some of the Whimsical Flower Die Cuts and Rub-Ons. I also used some Project Life cards as layers behind my photo. I used a Vicki Boutin Ephemera Die Cut here above the photo as well as another Whimsical Flower, a sticker strip from the Whimsical Sticker Book, and a Jen Hadfield word sticker. Here are a few more close-ups of the die cut leaves and mixed media background. Thanks so much for stopping by, and have a lovely day!